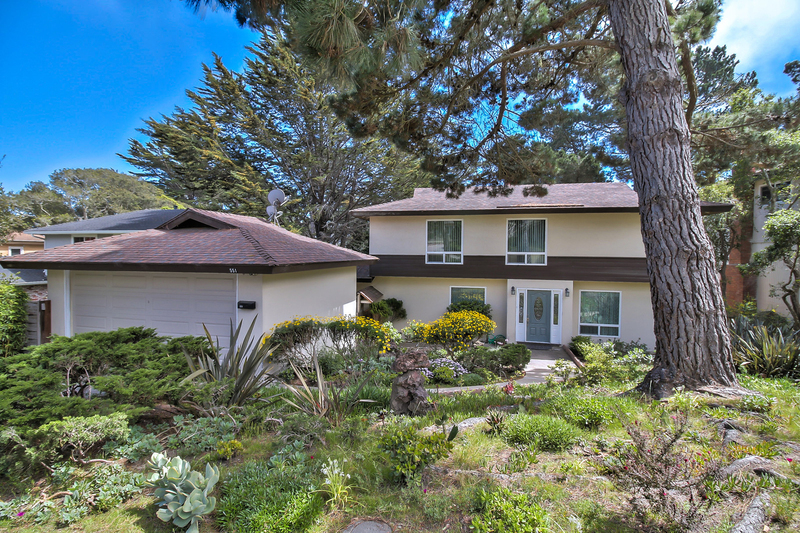 Call listing agents Jeff Davi or Mark Bruno with the Monterey Peninsula Home Team to see if this property is still available and to set up an appointment to view inside this home (831) 313-2289. 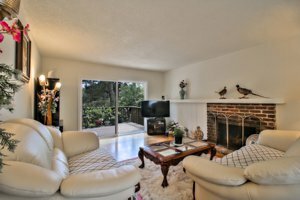 You are going to love this impeccably kept, wonderful 2 story Monterey home for sale located in the Skyline Forest neighbor of Monterey, CA. At over 1600 square feet, with 4 bedrooms and three full baths, this home can accommodate. Although it was built in 1960, it shows tremendous pride of ownership and there have been various upgrades over the years. The windows and doors have been replaced, the hardwood floors have been refinished, the bathrooms have been updated and after the newer roof was put on, a Solar City solar system was installed. The feeling once inside is cozy and comfortable. There are oak hardwood floors throughout the house. The living room has a classic wood burning fireplace made out of brick. There is a large sliding glass door leading to a deck and a spacious backyard. Also, on the main level is the dining room, kitchen, Laundry room and a full mini master bedroom with a full bath and a walk-in closet. 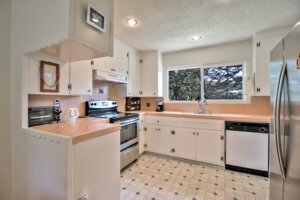 The kitchen has newer flooring, but the original cabinets and tile from the early 1960’s remains in impeccable condition! There is a dishwasher, a newer range and a newer Refrigerator. In addition to the mini master bedroom on the main level, there are three more bedrooms on the upper level including a master suite with its own bathroom and a hall bathroom to be shared by the other two bedrooms. 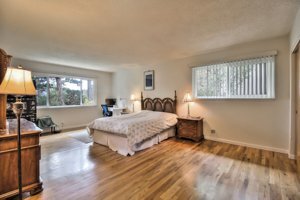 The master bedroom is large at 20’ x 13’ and has room for a small sitting area or a desk. 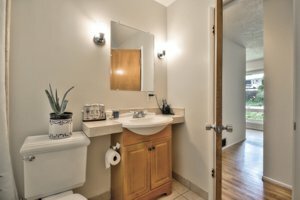 Additional amenities include a detached 2 car garage, a good sized laundry room and a large backyard with a sports court and a small garden. Monterey’s Skyline Forest Area is a great place to call home! It is ideally located close to the coastal cities but sits high enough to be just beyond the reach of the summer fog on most days, making the climate particularly enjoyable. Residents enjoy average high temperatures of 77 degrees in the summer and 58 degrees in the winter! It doesn’t get much better than that! Skyline Forest is located in the city of Monterey, CA and has the same general zip code as the rest of Monterey, 93940. This unique neighborhood incorporates a thin swath of land at the top of the mountain just west of downtown Monterey. It borders Pebble Beach to the west, Huckleberry Hill Nature Preserve and Veteran’s Part to the north and the intersection of Skyline Road and Forest to the South. Monterey and Skyline Forest offer all sorts of outdoor activities making it a popular place to purchase a home on the Monterey Peninsula. With Huckleberry Hill Nature Preserve and Veteran’s Park bordering the north of the Skyline Forest neighborhood, there are plenty of hiking trails around. Downtown Monterey is only a mile or so away which has great restaurants, nightlife, museums, Fisherman’s Wharf, the Monterey Sports Center and more. Cannery Row and the Monterey Bay Aquarium is nearby along with quaint Carmel-by-the-Sea, America’s last hometown Pacific Grove and the home to several of America’s favorite golf courses, Pebble Beach. You will never run out of things to do her in Skyline Forest. 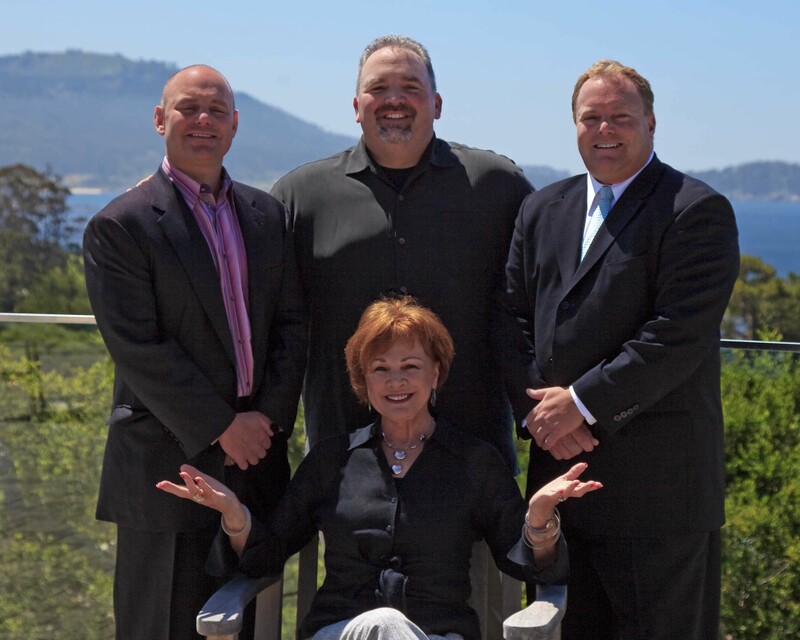 Monterey’s Skyline Forest area real estate represents real estate with some of the best Monterey Bay views in all of Monterey. If you are looking for a Monterey luxury home or ocean view real estate in Monterey, Skyline Forest is a great place to start your search. Homes inside the Skyline Forest neighborhood generally start above $400,000 for a condo and are estimated as high as $3M+. Recently a Craftsman style luxury home in Skyline Forest sold for $1.6M which is not uncommon for this neighborhood.